A Few Thoughts on Love, Writing, and My Mom | Writing & Book Coach | Marla Beck, M.F.A. a tin box containing my mother’s 1953 green card photo, her parents’ German passports and a handwritten letter from a war-time friend of my mom’s biological father, detailing how mom’s dad had died in the war, and expressing his condolences for the family. 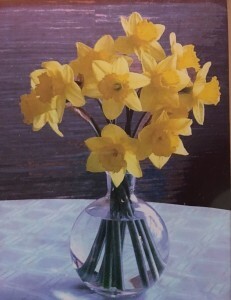 a professionally framed and Photoshop-altered photograph of daffodils in a glass vase, with this note inscribed the back of the frame: “Vase from Marla; flowers from Jim’s yard; tablecloth from Helga.” My mom was not a sentimental woman – or, so I thought. Here, though, she had captured a still life with objects from her daughter, her partner and her sister, and thought enough of their juxtaposition to hand-write the objects’ origins on the back of the picture frame. Discovering this surfaced a deep tenderness within me. savoring the Divine presence I often sense in blues music sung authentically; Bach pieces played well; and the mind-blowingly varied shades of green that cover the grassy hillsides during Northern California’s rainy winters. How do you define “love” for yourself? Where do you notice expressions of love in your own life? We writers are gifted with an accessible, fulfilling pathway to love that our less creative friends can only yearn for. Are you tending to this precious talent of yours? 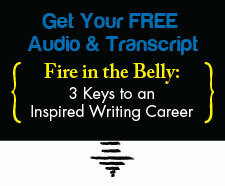 Have you been allowing yourself time to write? Permission to pursue what matters most? Are you occasionally feeling moments of great love or gratitude when you write? If not, it’s time to restore your love for writing. Your relationship to your creativity and productivity deserves tending to — just as much as if it were a treasured relationship in your life. Reach out to me at https://coachmarla.com//contact and let me know what’s going on, if you need help. I’m happy to share with you my proven solutions to help you regain your love and joy for your writing, your book project and your life. Previous post: This Makes Me Mad.